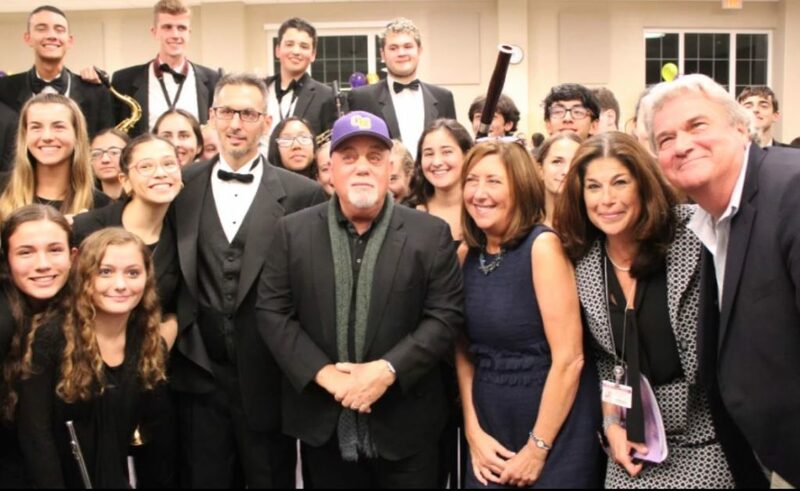 Oyster Bay, NY – In a magical evening of music and community pride, Oyster Bay’s own legendary musician, Billy Joel, helped the Oyster Bay-East Norwich Central School District cut the ribbon on its newly expanded Fine and Performing Arts Wing at Oyster Bay High School, Sept. 25. 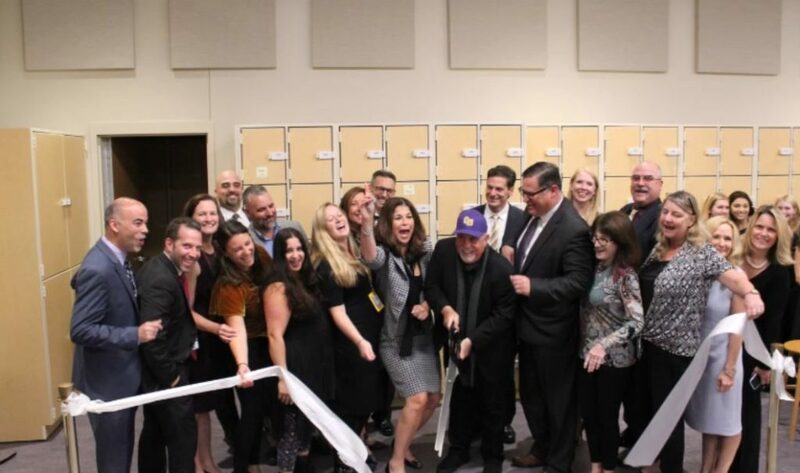 Mr. Joel, a longtime advocate of music education and the arts, received wild applause from students, staff and the community as he entered the newly constructed band room. He got even more applause when he switched his Hicksville baseball cap, where he is originally from, to a purple and gold Oyster Bay cap. “When I was in high school I was in band, and we had a practice room but it wasn’t as nice as this,” he said, standing before the Oyster Bay Wind Ensemble and Chamber Singers who prepared to perform some of his music. “A lot of important things happened to me in a room like this…The most important thing is, I would sneak off to one area where there was a grand piano and I would play the piano…I would write songs and it gave me an opportunity to play, hear music and work with other musicians. And that’s going to be very important in your life, whether you become a musician or not, the ensemble work; the community that you create with other musicians is very important,” he said. After wishing students good luck with the new space, the Wind Ensemble, under the direction of Mr. Matthew Sisia, played Invention in C Minor as well as a medley of Mr. Joel’s most popular songs, while the Chamber Singers, under the direction of Ms. Meagan Dissinger, sang a sweet rendition of Oyster Bay. The Fine and Performing Arts Wing was a longtime vision for the District that was the subject of numerous community meetings and many consultations with the District’s architects, parents, staff, administrators, residents and the Board of Education. That vision started to take shape on Dec. 17, 2015 when residents approved a bond issue slating $6,990,791 for the expansion. After securing approvals, the project, designed by BBS Architects, Landscape Architects and Engineers, broke ground in the summer of 2017 and was substantially completed by opening day, 2018. The new wing features a bright, modern interior and an exterior that maintains the traditional integrity of the building. Among the scope of work was the renovation of three classrooms, including a digital art room; a new 3-dimensional sculpture and design room, a new choral room and band room that are equipped with air conditioning and state-of-the-art equipment, offices and storage space. Board of Education President Mr. John McEvoy, called the District’s music and fine arts program “a center of excellence for us.” “This is where to practice to get to Carnegie Hall,” he said, referencing last year’s Carnegie Hall performance by Oyster Bay High School’s Wind Ensemble and Symphonic Band. Thanks also went out to the custodial and clerical staff for their hard work in preparing the facility for the ribbon-cutting ceremony and the Oyster Bay community for supporting the bond proposition. She also expressed gratitude to community members who give back, acknowledging the donation of a beautiful piano.